Daily Illuminator: Day Of Wreckoning Event Locations! March 20, 2018: Day Of Wreckoning Event Locations! 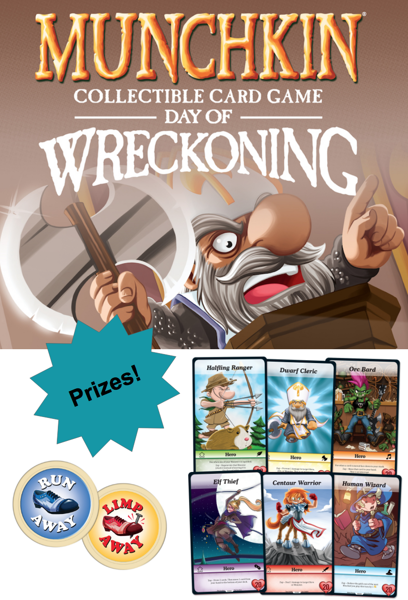 It's time to hone your Munchkin Collectible Card Game skills, get some prizes, and meet other Munchkin CCG players. It's time for the Day of Wreckoning! More than 130 stores across the U.S. and Canada will host these events on Friday, April 6; Saturday, April 7; or Sunday, April 8. Find a store near you in the list below, call them for their event time and date, mark your calendar, and prepare for a Wreckoning. Some stores will run their Day of Wreckoning as a draft or a constructed tournament. Others may run learn-to-play or casual-play events. But each event location will definitely have 12 oversized Hero cards to give away as prizes, plus one premium poker-chip-style Runaway token (see the image to the right). We are also running a social-media contest during these events: Post to social media with #PlayMunchkinCCG and a picture of your event on April 6, 7, or 8, and you're automatically entered to win a set of one each of the three W-rarity cards, signed by the game's award-winning designer Eric M. Lang. And now, on to the list of locations! Please note that this store's Day of Wreckoning prize kit did not contain a poker chip Runaway token. 2680 Dr. M.L. King, Jr. Blvd. 18105 SW Tualatin Valley Hwy.